It's a special day in a girl's life when she puts together her first cheese tray. I had this old breakfast tray that I never really used (but kept because obviously everyone should have a breakfast tray? ), and decided it would be the perfect cheese platter. But part of the reason I never used it was because it was this really light wood (I'm not super into really light wood right now - it looks too fake), so I decided to paint the bottom part. With chalkboard paint, because, hello? I'm a Pinterest user. Also, it's much cheaper to paint stuff with chalkboard paint yourself than it is to buy it already chalkboarded. So I painted it with two coats of black chalkboard paint, bought some chalk, scribbled and wiped until it looked sufficiently "used," and went to work laying our the cheeses. I'm a cheese person. I never met a cheese I didn't like. That's a lie. But I like a lot of cheeses. I made a list of some of my favorite cheeses, then realized I had chosen a really good variety of flavored, plain, hard, soft, sweet, savory, cow, goat, and varying regional cheeses. There are a ton of different combinations you could do for a cheese tray. The biggest rule is to serve what you like. All other rules are bunk (though, there might be something to the "keep super stinky cheeses on a separate plate" rule). I set out some local honey from the farmer's market and a jar of fig jam to go with the brie, and the fig jam in particular was a big hit. 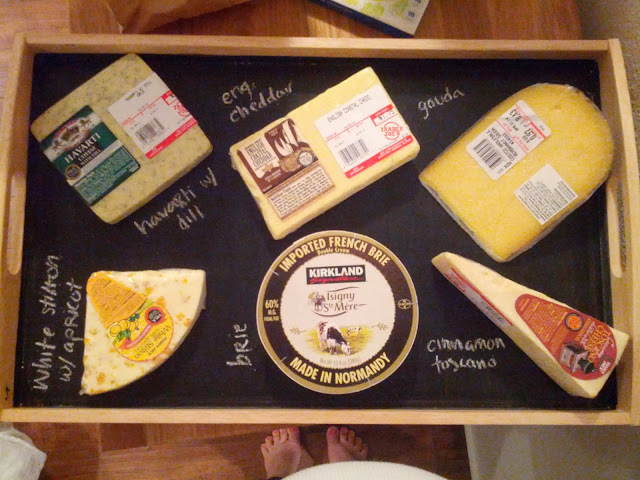 I thought it was a really good spread of cheeses, and it looked really fun on the chalkboard tray. In fact, the cheese tray was so popular that they were all gone before I got a picture. I loved how it made something special out of something simple. If you're having friends over for dinner (or just looking for an excuse to try some cheeses you've never had before), put together a little cheese course. People will be very impressed and it will hardly take any effort from you. Cute!! I also love love love cheese, except for Swiss. But I keep trying!